As news organizations respond to the economic challenges of the digital era, one such response has been to focus on sales teams that had long been steeped in a legacy culture. Among the papers surveyed for Pew Research’s March 2012 report on “The Search for New Business Models,” more than three-quarters reported working on retraining their sales staffs and changing the way they are compensated. At the Naples Daily News, publisher Dave Neill and his team have gone considerably further. As part of a broad cultural change at the paper that began almost three years ago, the News overhauled its sales operation with a change in personnel, structure and operating philosophy that included rethinking the basic concept of how sales territories are configured and managed. The results at the News, which serves a Florida Gulf Coast resort community, stand out in an industry where many dailies continue to suffer from declining ad revenue, particularly on the print side. While total newspaper industry ad revenue, print and online, dropped by more than 7% in 2011 and by about another 6% in the first three quarters of 2012, according to the Newspaper Association of America, revenue at the Daily News grew in 2011 and then was up every quarter in 2012 over the same period a year earlier. When parent company Scripps releases its quarterly financial results, there is often a section singling out the economic performance in Naples. 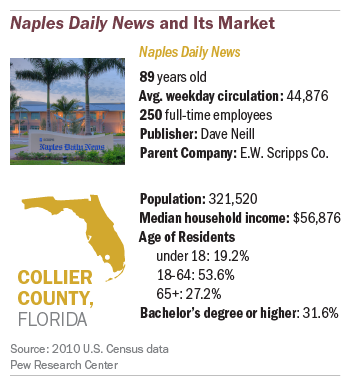 Some of the success in Naples is related to the area’s newspaper-friendly demographics-an older wealthier population that has helped the Daily News hold on to the print franchise better than most dailies. Collier County, which includes the paper’s home community of North Naples, has a population of about 322,000 according to 2010 census data. While Daily News executives say residents are getting younger, 2010 census data indicate that 27% are 65 or older, 10 points higher than the state average. The median household income is about $57,000 a year, about $10,000 higher than the state average and the median value of an owner-occupied housing unit is $317,000, almost twice the state average. As a resort spot on Florida’s West Coast, the Naples region sees significant seasonal population shifts that are reflected in newspaper readership. In winter, the paper’s circulation can swell as high as 100,000. In summer, it can dip to one-third of that. Neill is not shy in discussing what he sees as excess timidity in the newspaper industry. Like Clark Gilbert at the Deseret News, Neill talks about restructuring the paper to compensate for a less robust business model in the wake of a significant economic downturn toward the end of the last decade. “Our business was bigger years ago than it is now,” he says. “We had a larger staff, we had higher revenue…we have redesigned our business to fit the market [and] fit the world.” By 2009, the publisher says, he began to work in earnest on changes in the “structure and culture” at the News. The re-imagining of the Daily News sales operation involved several major steps-the most fundamental of which was replacing the old sales territories, based on geography, with jurisdictions built around business categories or “business units.” That began by evaluating the Naples market, trying to figure out which business units to create. Part of that process included examining Daily News coverage of the community. In late 2009, about one-third of the sales staff was assigned to new category-based business units and the results emerged quickly. “For the units assembled, we did see significant growth,” Neill says. “We saw a trend where business units were outperforming general” advertising sales. Neill and his top sales executives spent months on the evaluation before sharing the plan with the entire sales staff. In November 2012, the entire sales operation converted over to the business unit model. Today, the roster of business units includes: a health and wellness team; a transportation team; a real estate and finance team; a fashion, beauty and arts team; a home services team that includes everything other than real estate; a food team; an advocacy and education team; and a community publications team. Several other teams handle business development, advertising operations and special sections. In creating the units, the Daily News tried to combine businesses that shared economic connections. For example, the transportation unit not only includes cars, but boats and marine transportation businesses as well as the ancillary businesses connected with automotive, such as detail shops, car washes and tire centers. The real estate unit was broadened not only to include the sale of property, but other businesses intertwined with that, such as banking and finance. The sales restructuring remains a work in progress. Late in 2012, the paper embarked on a four-month evaluation of the business units that led to significant changes in both the sales units and the staff assignments. Home services, for example, was separated from the broader real estate category and additional resources went towards the growing health and wellness sector. According to Neill, about 33% of the sales staff was reassigned to different units as a result of this process. The goal was to change the operating culture, to break up old lines of authority and to filter substantially more decision making power down to the units, the directors and account executives. While the current group of business unit directors (some of whom have work experience in the areas they oversee) report directly to Neill and meet with him every Thursday, they also have a good amount of autonomy and meet among themselves every Monday. That decentralization of authority has many manifestations. For a few years, the paper’s biggest advertiser used to negotiate its annual contract directly with the publisher, something Neill characterizes as a “year-long battle.” Now, that deal is cut directly with the ad director and Neill never has to pick up the telephone. As a sales incentive, the News created the Ad Club about three years ago. The highlight of belonging to the Ad Club is a quarterly awards ceremony for high performing sales staffers. Initially, membership was open to those who made 75% of their sales goal, but that bar has now been raised to 100%. Club members attend a catered party at a downtown spot and are honored with a trophy. Neill does not divulge detailed revenue information, but it is possible to get an overall picture of the financial health of the Daily News. The publisher says revenue has grown in both 2011 and 2012. For 2012, growth occurred in all four quarters compared with the previous year. Data from Scripps support signs of growth, showing revenue at the paper for the first quarter of 2012 up about 10% from the same period a year earlier. While Neill does not provide a specific breakdown of print versus digital revenue at the paper, it is clear that in Naples print is quite healthy and brings in the overwhelming majority of income. Given widely vacillating numbers depending on the time of year, the paper has maintained or increased its circulation. In the most recent report for the six months ending in September 2012, average daily circulation (34,000) for just the print product without the digital editions was virtually identical to that for the same period in 2011. In the six months that ended in March 2012, however, average daily print circulation was about 54,000, up 20% from the same time a year earlier (45,000). “Digital and print circulation growth is our top priority,” Neill says. There is also some evidence that the new ad unit structure is working. For one thing, Neill says that the new units have effectively captured much of the paper’s advertising income, with only about 20% of ad revenue now coming from outside those business categories. He also says the overall number of advertisers or “business count” has increased in both 2011 and 2012. Asked to estimate how much additional ad revenue the paper has generated as a result of the restructuring of the sales operation, Neill says “we’ve improved our business by at least ten percent,” which is enough to account for much of the revenue growth in the past two years. 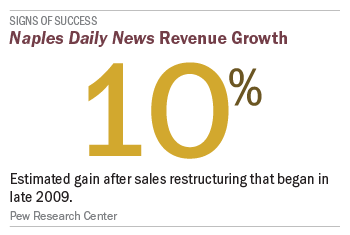 One thing the restructuring at the Daily News did not involve was significant new funding. “It was simply reorganization,” says Neill. It also initially ruffled feathers among some advertisers who were concerned about losing an account executive with whom they had forged a relationship. “There were questions from some of the businesses who called me a directly and said ‘why the hell are you doing it? '” the publisher recalls. And while his ad directors speak glowingly about empowerment and the decentralized lines of authority, it was not an easy concept to sell. Neill says he received much support from Scripps corporate headquarters about his reorganization plan, although “there were a lot of questions.” In talking with people in Naples, it is clear that Neill is widely admired by his staff, in part for his ability to “manage up,” which can allow for flexibility for the local market. The effort to implement a cultural change that emphasizes “professionalism and customer service,” is not limited to the sales side. One of those changes has meant an enlarged role for the circulation department, which is more involved in cross-departmental communication with advertising and editorial operations. Heck and circulation sales director Jorge Velasquez recall, not so fondly, the days when they had to punch in a code at the doorway to gain access to the newsroom. “Circulation was something that happened at night and they were in this dark corner of the building and nobody really knew what was going on back there or who was running it,” Neill says. On the editorial side, Neill believes the newsroom is now progressing on the transformation of the paper’s digital and print platforms. “The Lighthouse Project was one where I wanted us to clearly take a leadership role in the community,” the publisher says, adding that “our plan is to better integrate this with our editorial content,” so that going forward, more stories will be published under the Lighthouse brand. Some of the key lessons from the Naples experience are related to the publisher’s leadership philosophy. Create an environment of greater “professionalism.” One of the ideas in restructuring the sales units, was to, in effect, upgrade the status of account executives so they were not just selling, but becoming experts in various sectors of the local economy. “What I want to do is to… help develop the staff [so] that when they wake up in the morning and report to the office, they are part of a professional environment, working as professionals in their business units,” Neill explains. 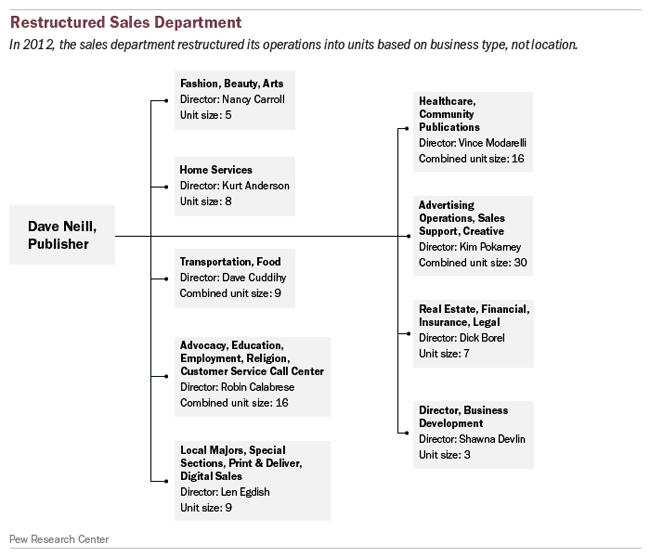 Fundamentally rethink the structure of the sales department. In Pew Research’s March 2012 report on the search for new revenue models, the idea of revamping aspects of the sales operation-from training to compensation-was popular with a strong majority of the papers that responded. In Naples, they have gone further, rethinking the basic concept of sales territories and restructuring sales management around these new business units. Print is not dead. In Naples, according to one observer, the moral of the story is “don’t give up on print.” The publisher is bullish, saying “we are going to reinvent print” and envisioning a future where the print product could be customized for the individual consumer. At many dailies, that may seem overly optimistic. But the lesson from Naples is that in communities where conditions are favorable, a substantial bet on print can still pay off.